A heart wrenching and chilling observational doc about immigrant “illegals” held in a detention centre and subjected to prison-like conditions without any rights. This special screening is co-presented by No One is Illegal and Solidarity Across Borders. Robyn Maynard & Jaggi Singh will be our guest speakers. SYNOPSIS: Each year, thousands of men and women in Switzerland are imprisoned without trial or sentence. Simply because they stay in the country illegally, they may be deprived of liberty for up to eighteen months before being deported. After The Fortress (awarded with the Golden Leopard at the Locarno International Film Festival), which dealt with the reception conditions for asylum seekers in Switzerland, Fernand Melgar takes a look at the other end of the chain, i.e. at the situation towards the end of the migrants’ journey. 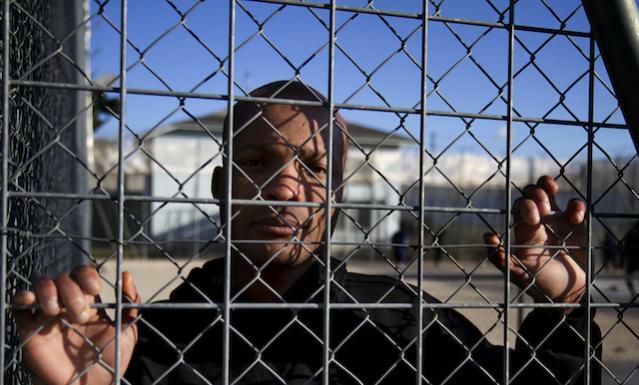 The filmmaker immersed himself for 9 months in the administrative detention centre Frambois in Geneva, one of the 28 deportation centres for the paperless in Switzerland.